Located at 700 Laurel Avenue, Webster Play Area is over 19 years old. 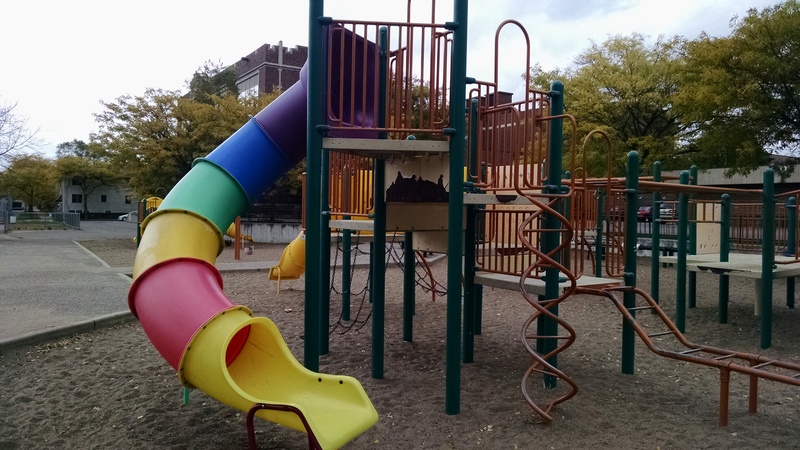 CIB funding has been secured to replace the existing play equipment, install resilient surfacing for ADA compliance and safety, and provide seating and landscaping. Construction is projected to be completed in the September of 2016. Mural Design Community Meeting: We are looking for community input and guidance in the design of a new Webster Play Area mural! Come exchange ideas with the artist and city staff and be part of the creative design process on Tuesday, September 12, 2017 from 6pm-7:30pm at Webster Play Area. Meeting may be moved indoors in case of rain. Construction for the Webster play area is nearly completed and on schedule to be wrapped up prior to Labor Day weekend. Construction has begun for the Webster Play Area Project with a completion date scheduled for September 2, 2016. During this period, we ask that you avoid the construction zone until the new play area is completed and all safety fencing and construction materials have been removed. The rest of the park will remain open throughout the summer. Community Meeting #1: Presentation to the Summit-University Community Improvement and Safety Committee. January 8th, 2015 - 6:00 PM 627 Aurora Ave.
Community Meeting #2: Presentation to the Summit-University Neighborhood Development Committee. January 20th, 2015 - 6:30 PM 774 University Avenue.